When the Tuskegee Airmen, the all-black force of elite pilots, emerged from combat in World War II, they faced as much discrimination as they had before the war. It was not until six decades later that their valor was recognized and they received the Congressional Gold Medal, the highest civilian honor Congress can give. Now, the roughly 330 pilots and members of the ground crew who are left from about 16,000 who served are receiving another honor that has surpassed their dreams: They are being invited to watch the inauguration of Barack Obama as the country’s first black president. “I didn’t believe I’d live long enough to see something like this,” said Lt. Col. Charles A. Lane Jr., 83, of Omaha, a retired Tuskegee fighter pilot who flew missions over Italy. “I would love to be there, I would love to be able to see it with my own eyes,” he said, chuckling on the phone as he heard about the invitation. But, he said, he had a “physical limitation” and was not sure he would be able to attend. Thousands of people who participated in the fight for civil rights over several decades helped pave the way for Mr. Obama’s triumph. But the Tuskegee Airmen have a special place in history. Their bravery during the war — on behalf of a country that actively discriminated against them — helped persuade President Harry S. Truman to desegregate the military in 1948. “The election of Barack Obama was like a culmination of a struggle that we were going through, wanting to be pilots,” said William M. Wheeler, 85, a retired Tuskegee combat fighter pilot who lives in Hempstead, N.Y. He tried to become a commercial pilot after the war but was offered a job cleaning planes instead. The invitation to his swearing-in was extended Tuesday by Senator Dianne Feinstein, the California Democrat who is chairwoman of the Joint Congressional Committee on Inaugural Ceremonies. Tickets to the Jan. 20 inauguration are the most sought-after commodity, with more than 1.5 million people expected in Washington. Of the 240,000 tickets, the airmen would have seats among the 30,000 on the terrace below the podium, along with former members of Congress and others. For logistical reasons, the actual invitation ended up with Robert D. Rose, a retired Air Force captain in Bellevue, Neb., who was not a Tuskegee airman but is the first vice president of the Tuskegee Airmen Inc., an association of the original airmen and their supporters. The onus is on the association to extend the invitation to the airmen, who must respond by Dec. 19. Each can bring one guest. The tickets are not transferable, so if an airman cannot make it, he cannot give his ticket away. “We’ll have a lot of happy fellows and ladies,” said Mr. Rose, who predicted that many would try to attend. He said that before the invitation was made Tuesday, he had already been trying to get word to higher ups that the airmen would like to be invited. “I thought if the name ‘Tuskegee’ surfaced at a high enough level, someone would recognize it and it would make sense to invite them,” he said. There is no firm handle on how many are still alive. More than 300 came forward in March 2007 to collect their bronze replicas of the Congressional Gold Medal at a ceremony at the Capitol. The actual Gold Medal itself was given to the Smithsonian Institution. 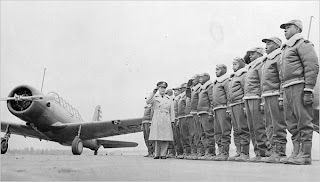 In all, 994 pilots and about 15,000 ground personnel collectively known as the Tuskegee Airmen were trained at the segregated Tuskegee Army Air Field in Alabama from 1942 to 1946. About 119 pilots and 211 ground personnel are still alive, according to Tuskegee Airmen Inc. They are in their 80s and 90s, many are frail, and it is unclear how many will be able to make the trip to Washington. And those who make it will face various challenges: they will most likely have to walk some distance, the weather could be harsh, the crowds will be huge and accommodations are scarce. Still, these are some of the airmen who flew more than 150,000 sorties over Europe and North Africa during World War II, escorting Allied bombers and destroying hundreds of enemy aircraft. Some were taken prisoner. And most faced fierce discrimination during and after the war. “Even the Nazis asked why they would fight for a country that treated them unfairly,” President Bush said in awarding the medals. Mr. Rose, of the airmen’s association, said he saw a direct connection between the Tuskegee experience and Mr. Obama’s election.